U.S. Navy Chief Petty Officer Ret. James W. Smith, 97, of Staten Island, NY passed Wednesday evening, October 10, 2018 at the New Vanderbilt Nursing Home. A native of Staten Island, Mr. Smith was the son of the late Walter and Mable Smith. 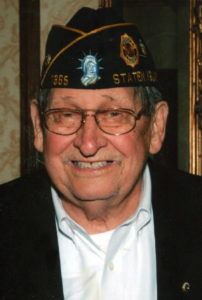 With a 20 year career in the United States Navy, James served from 1939 in W.W. II, Korea and Vietnam and retired in 1959 with the rank of Navy Chief Petty Officer. After serving his country, James then worked for the City Service Company as an office worker for twenty three years until his retirement in 1983. In his spare time, James enjoyed gardening, working on his house, anything to do with maintenance and he was also an avid reader. Mr. Smith is survived by several cousins and many close friends. He will be deeply missed by all who knew him. Funeral will be held at Cherubini McInerney Funeral Home, 1289 Forest Avenue, Staten Island, NY on Monday, October 15, 2018 at 10:00am followed by a burial with the Navy Honor Guard at Fairview Cemetery. Family and friends are invited for viewing on Sunday, 2-4pm & 7-9pm. Mr. Smith a Travis Icon. What a gentleman. Remember all the days in Phene’s. He loved Travis and its neighbors. Always coming to the firehouse (oceanic) and telling the history of Travis. He was also the last sitting President of the Washington Citizen Club which I joined in 1993. RIP Mr. Smith. You will be missed. Lots of good phone calls and memories. You are now in heaven with Dad (Ralph) & Victor. You have lots to talk about!